The Political Bureau will issue a new resolution that serves as basis for Viet Nam to improve institutions, including tax policies, on foreign investment attraction in years to come. The news was announced yesterday at a meeting involving ministries, sectors, and localities to discuss on a draft project on orientations for improving policies and quality of foreign investment through 2030. The project will be submitted to the Political Bureau for approval. After more than three decades of foreign investment attraction. FDI sector has become an important part of the economy, contributing significantly to national development, emphasized Deputy Minister of Planning and Investment Vu Dai Thang. So far, Viet Nam is home to 26,500 FDI projects worth US$ 334 billion from 129 foreign countries and territories. In 2017 only, the sector accounted for 20% of GDP, contributing 23.7% of total social development capital, over a half of industrial production, 70% of total export turnover and generated nearly 4 million direct jobs and 5-6 million indirect ones. Apart from the aforesaid positive effects, Viet Nam also faces with certain side effects that require new approach. Thang said the introduction of the future resolution will be of great significance as it creates a foundation for selective FDI attraction in line with the country’s current transformation process while minimizing the shortcomings of foreign investment. 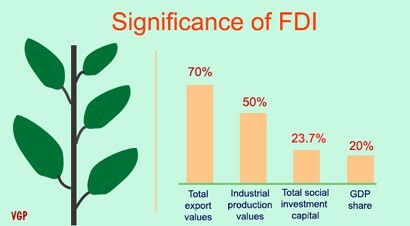 The FDI sector will still remain as a key component of the economy but it should be encouraged to set up partnership with domestic enterprises to strengthen Viet Nam’s status in the global value chain, ensure the independence of the economy and national security. To make the project well-prepared, the Ministry of Planning and Investment (MoPI) had collected comments from 11 other ministries, 63 localities, the World Bank (WB), the Organization for Economic Cooperation and Development (OECD) at a conference reviewing 30-year of foreign investment last year. Also at the conference, delegates pointed out ten good points and six limitations of the FDI sector to the domestic economy. Addressing the meeting, Deputy PM Vuong Dinh Hue assessed that the draft project mentions a wide range of issues related to FDI but has yet named key realities of the sector. He urged the relevant ministries to continue seeking experts’ comments and concretizing instructions of the Prime Minister at the Conference on reviewing 30-year FDI attraction in Viet Nam. Particularly, inferior levels need to clarify whether we have two economies in a country as some experts have said in order to have right viewpoints and solutions for foreign investment attraction while promoting the strengths of domestic economic sectors in the process of building an independent and self-reliant economy. The draft project also needs to include evaluation of the impacts of technological revolution and latest tendencies of the international investment flows, Hue required.